Discussion in 'Early CJ-5 and CJ-6 Tech' started by Strider380, Dec 31, 2018. Strider380 Can I have a zip tie? Thank you everyone for the advice i’ve never had to deal with this before and you’ve been very helpful. Can i pull the three bolts for each rocker assembly and turn the starter to see if oils squirting? Or does it need to be done by pulling the distributor? 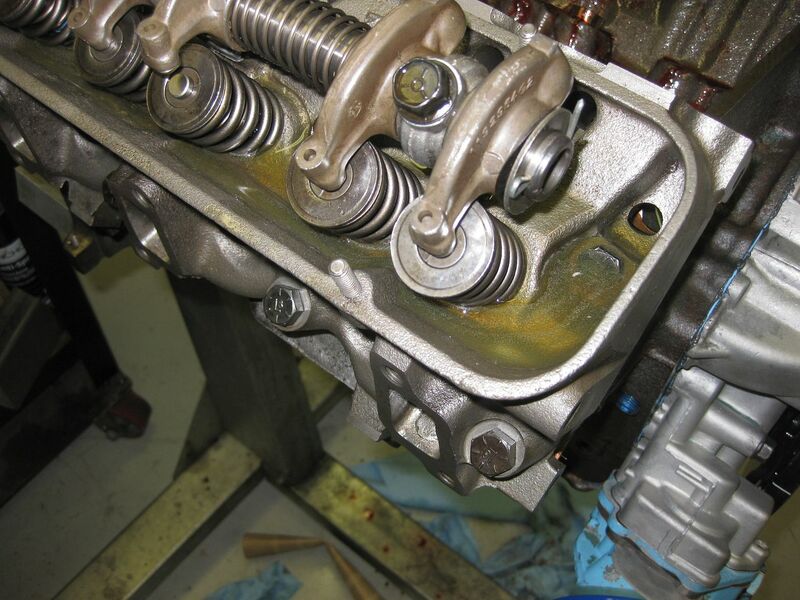 If you were to crank the engine without the rocker shaft, you risk having the lifters kick out of their bores, which will dump any oil pressure. I wouldn't recommend this. Pull distributor and use a drill to spin up the oil pump. you're gonna need a tool to do it. Either an old distributor or another one of your making or purchased. The valve that is directly next to where the oil filter screws on...is it suppose to be open or closed? I found it sideways jammed open. I'm not a V6 guy but it sounds like that may be the pressure relief that I mentioned in post #2. I agree with the folks above. I wouldn't put any load on the crank bearings until you get it back together. Lke Donny said, if you kick the lifters the push rods could drop down into the engine or get jammed and bent. Don't do it. However, I do recommend doing yourself a favor and spend a few minutes and make a priming tool that fits perfect. Take a long large flat head screw driver with a hex head just below the handle and grind down about half of the tip then remove the sharp edges. cut it off at the handle but keep the hex head and you have a perfect fit that will not bang up the slot on your oil pump. Chuck it up tight so it doesn't drop down into the timing gear housing. Now you can remove the rockers and when you spin the oil pump oil should shoot at least several inches and that is a good sign. If it trickles out you have a problem and need to figure out if it's at the oil pump or up in the gallies. When you get good flow into the head, you may want clean the lifters and that will involve taking the intake manifold off. They are probably gummed up also. It's a 10.00 gasket and some carb cleaner so it's a cheap job. If you decide to go that route, let me know and I'll tell you how to pull the lifters apart. Super easy and you can clean those galleys also when you remove the front lifters. Drain the coolant if you decide to remove the manifold or some will spill into the intake cavity and you will have to dump your oil. While you are doing all of this I would have some high detergent additive in the oil or even some engine flush. This will help clear things up. Dump the oil when you get everything resolved. It should be black. I just click and drag them off my desktop screen. I did do one side at a time. The side that trickled out, i tried dumping a shot glass of marvel mystery oil down... Neither side seems like the oil’s getting up through the rocker assemblies. Maybe i just dont know what to look for. This motor is supposedly rebuilt with ported and polished heads and a 4 barrel intake and carb...maybe i should have just gone with stock. I ordered an oil pump rebuild kit to see if maybe this ones just pushin too much. Pulling my hair out here. Porting and polishing the head or installing a 4 barrel intake have nothing to do with the oiling system of this engine or any other. These engines are notorious for inadequate oiling to the rocker arm assembly. 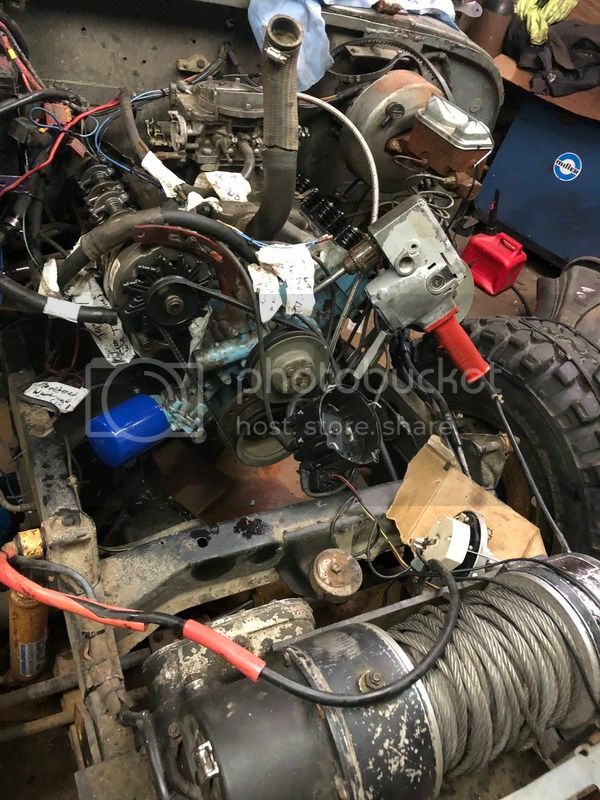 Why don't you take the rocker arm assembly and re install it to the side with known good oil pressure, leave the other side off and spin up the at oil pump to see how much oil will actually come out that side with some resistance from the other installed assembly. Agree with above. Let's break this down to basic troubleshooting, you have oil shooting out one side with rocker removed. The other side a trickle with the rocker removed. This tells me you have blockage on the one side. Stick a aluminum welding rod or something down the galley hole and see if it clears it up. Once you get oil shooting out both galleys, inspect your rockers. They are probably gummed up also. DO NOT use a short length of welding rod and chance dropping it into the oil galley. Why is there such a gap between the third rocker and the valve ? You got a bent or broken pushrod between the lifter and the cam ? Or maybe the rocker arm and the lifter? Oz , I assume you got that photo out of the "Blueprint 225" thread here on this site?........it's explained there whats going on............In any case No push-rods present in that photo so there not bent or broken........First I was priming the motor and getting oil to the overhead and then I was going to drop in the adjustable push-rods and adjust the valves for the Solid lifter camshaft...........all was good!